Well, what can I say about this devastating and jaw-dropping picture of our nearest spiral neighbor, the Andromeda Galaxy? Well, I could start with HOLY HALEAKALA! This image is a collection of 11 separate observations of Andromeda taken by NASA’s GALEX satellite. Launched in 2003, GALEX (which stands for Galaxy Evolution Explorer) scans the sky in ultraviolet light, specifically targeting galaxies. Hot stars produce UV light, and so does the gas it illuminates, so by looking in the ultraviolet astronomers can learn about how galaxies are constructed. In the decade since its launch, GALEX has been phenomenally successful, cataloging hundreds of millions of galaxies, some as far as ten billion light years away! This image of Andromeda is simply stunning. It’s comprised of two colors: what you see here as blue is higher-energy ultraviolet light, and red is lower energy (closer to the kind of light we see). Right away you can see that objects emitting the higher-energy UV are confined to the spiral arms, and lower-energy emitters are spread out across the galaxy. That’s exactly what I would expect: massive stars, the kind that really blast out UV, don’t live very long. They’re born, live out their short lives, and die (as supernovae) pretty much near the spot where they formed, which is in spiral arms. Lower mass stars live long enough to gradually move away from their nurseries, populating the rest of the galaxy. Also, star formation at the very center of the galaxy probably occurred long ago and shut down, so we don’t see many or any massive stars there. One thing I didn’t know is that the arms of Andromeda are more like rings! The galaxy is at such a narrow angle that it’s hard to tell, but if you trace the blue emission, the pattern does look more like a ring than a spiral. This jibes with earlier images in infrared taken by Spitzer Space Telescope (which I’ve inset here) and a huge and incredibly beautiful newer one taken with ESA’s Herschel far-infrared telescope (and OMFSM you want to click that link). From what I’ve read, it’s not clear why the spiral arms appear to be more ring-like. Which I love. Why? Because Andromeda is the nearest big spiral galaxy in the sky, a mere 2.5 or so million light years away. It’s easily visible to the naked eye from a dark site, and I’ve seen it myself countless times using my own eyes, binoculars, and telescopes ranging from small ones up to Hubble. Yet there it is, in all its huge and obvious splendor and beauty, still able to surprise me. That rocks. And a note about GALEX: NASA recently handed off its operations to Caltech, a very unusual move. The satellite was put into standby mode in February, and I was worried it would be shut down permanently. However, Caltech signed a three-year agreement with NASA — while NASA still owns the satellite, Caltech will now be in control of GALEX’s science mission, managing and operating it. At the end of the agreement it can be renegotiated if GALEX is still in good operating condition. This is an interesting idea, and I’m not sure how I feel about it. I love that GALEX gets to continue operations, but handing off science missions to private groups makes me a little uneasy. In this particular case I think it’s fine — Caltech is a research institute after all — but the precedent may have unforeseen consequences. We’ll see. Still and all, it’s good to see new life breathed into an important and wonderful instrument like GALEX. I certainly hope it will continue to produce cutting-edge science for years to come… as well as amazingly beautiful images like this one. 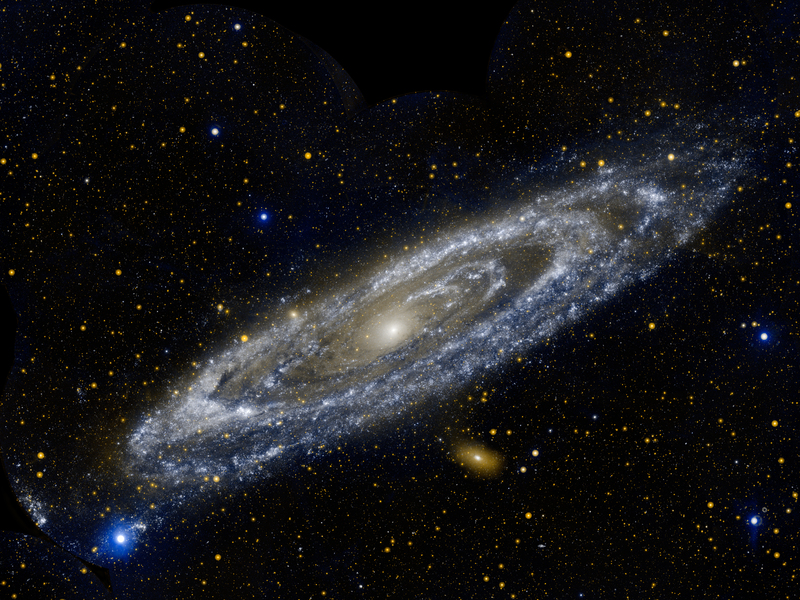 – Andromeda: born out of a massive collision?